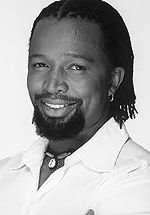 Sello Maake Ka-Ncube (sometimes credited as Sello Maake, or Sello Maake ka Ncube) is a South African actor and director best known to television audiences for his role as Archie Moroka on the SABC1 soap opera Generations, from 1993-1997 and again from 1998-2002. He was born in Orlando, Soweto, in 1960, but mostly raised in Atteridgeville, Pretoria. It wasn’t until he was 15 – when he saw Gibson Kente’s How Long – that he realised that he wanted to be an actor. Ka-Ncube is now one of South Africa's most esteemed actors, having performed in the United States, Britain, Canada and Europe. Films in which he has appeared include A Dry White Season (1989), The Rutanga Tapes (1990), Dark City (1990), Wheels and Deals (1991), The Good Fascist (1992), Bopha! (1993), Taxi to Soweto (1993), Djadje: Last Night I Fell Off a Horse (1993) and Othello: A South African Tale (2005). He also appeared in the made-for-TV movies A Woman of Color (1997) and Bridge of Time (1997). His stage credits have included Aaron in Titus Adronicus which he played both in South Africa and at London's National Theatre. He also starred in Fugard's Woza Albert, The Good Woman of Sharkville directed by Janet Suzman, Guess Who’s Coming for Dinner, Prophets in The Black Sky, Smallholding, Raisin in the Sun and The Suit which he played both in London and New York. After starring in the title role of The Lion King in London’s West End, Sello played the title role in Othello opposite Antony Sher for Britain’s Royal Shakespeare Company and in the West End of London. Apart from his prestige film and stage work, Ka-Ncube is one of South Africa’s most popular television stars from his lead role as busniessman Archie Moroka in the long running soapie Generations. He left the show in 1997 after a pay dispute but was brought back within a year after ratings on the show dropped following his departure. In 2002 his character was killed off on the show, and he decided to pursue his career abroad. He returned to South Africa in 2007 to take up his Lion King role Mufasa in the South African production of The Lion King, which opened to acclaim at Johannesburg’s Montecasino in early June. It was announced by e.tv in late June 2007 than Ka-Ncube will take over the lead of their soapie Scandal!, following the absconding of one of the show's stars, Luthuli Dlamini, who played the role of Stan Nyathi on the show. Dlamini was fired from the show on 29 June after not showing up on set for four weeks. Ka-Ncube will play the role of Daniel Nyathi, Stan's brother, from 2 August, 2007.